One of the world's richest men, Bill Gates has harped on the need for Nigeria to invest in its human capital. Gates, who stressed that Nigeria has unmatched economic potential, said growth would come naturally when Nigeria maximises its greatest resource – the people. He spoke yesterday at the expanded National Economic Council (NEC) meeting chaired by Vice President Yemi Osinbajo at the old Banquet Hall of the State House, Abuja. The multi-billionaire and Aliko Dangote also visited the Emergency Operations Centre for polio in Abuja. 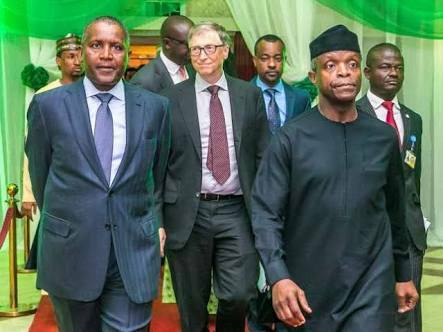 Gates, whose foundation has invested more than $1.6 billion in Nigeria to date, is in the country to see first-hand the progress in primary healthcare provision, polio eradication, nutrition and financial inclusion. He said: “The Nigerian government’s Economic Recovery and Growth Plan identifies ‘investing in our people’ as one of three ‘strategic objectives. But the ‘execution priorities’ don’t fully reflect people’s needs, prioritising physical capital over human capital. Gates urged political leaders to maximise the country’s resources which are its people as a way to help it to thrive. He said: “But growth is not inevitable. Nigeria has unmatched economic potential, but what becomes of that potential depends on the choices you make as Nigeria’s leaders. “The most important choice you can make is to maximise your greatest resources, the Nigerian people. Nigeria will thrive when every Nigerian is able to thrive. Gates added: “You see this risk in the data. From the point of view of the quality of life, much of Nigeria still looks like a low-income country. Let me give a few examples. “In the middle income countries, the average life expectancy is 75 years. In lower middle income countries, it’s 68. In low income countries, it’s 62. In Nigeria, it is lower still: just 53 years. “Nigeria is one of the most dangerous places in the world to give birth, with the fourth worst maternal mortality rate in the world, ahead of only Sierra Leone, Central African Republic, and Chad. Noting that his foundation with the largest headquarters in Africa is sited in Nigeria, he said that he has also committed the sum of $1.6 billion in Nigeria with a plan to increase the amount. Making a PowerPoint presentation of a model of the trajectory of Nigeria’s economic growth, relating to health and education, Gates observed that if the present trend continues, Nigeria cannot keep up with its population growth.